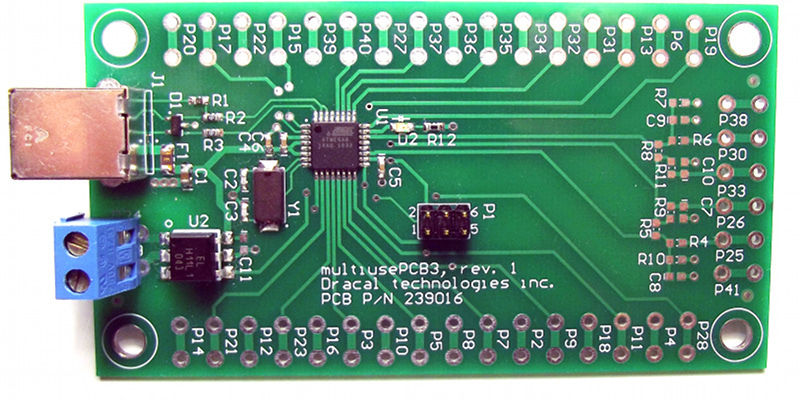 This is a design based on the Atmel Atmega8a meant to be used with the V-USB driver. Most of the MCU inputs/outputs pins are exposed. The footprint used to expose signals is compatible with many terminal blocks and with quickconnect tabs. Otherwise, it is easy to solder wires directly to the board. One optically isolated input can be populated. On-board USB Type B standard connector. One on-boad LED for feedback controlled by the microcontroller. Components required for V-USB operation are present.